Hi, this is Jeff. Today, I'd like to talk to you about hands-free control valves. Typically you see hands-free control valves around hand sinks, pre-rinses, and other applications in a commercial kitchen. Typically there's two ways to achieve hands-free hand washing. One would be by using an electronic-eye faucet or the other would be by using a Fisher knee valve or foot valve. With an electronic-eye faucet you have solenoids, batteries, and electronic components that do fail and when a hand sink in a commercial kitchen fails, it becomes a health department issue. When the electronic-eye faucet fails, the plumber generally cannot repair it, so it becomes a remove and replace. Removing and replacing is very expensive because of the cost of the faucet. 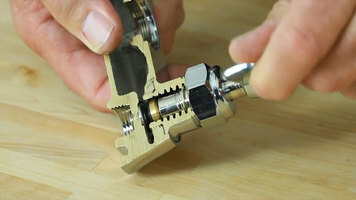 Should the mechanical valve fail, any plumber can come in and with simple tools, simply replace the cartridge and the customer is up and running again with very little expense. 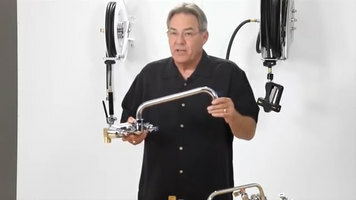 Fisher hands-free valves are very easy to install simply using supply lines connected to a temperature adjusting valve, if required, and then connected to the spout. These valves are easy to maintain because we use a renewable cartridge with standardized parts that virtually any plumber or end user can replace in just a few minutes. They have an anodized pedal that won't rust and lifts for easy cleaning. So when it comes to hands-free solutions using foot and knee valves, think Fisher. Thanks for watching. Both easy to use and easy to install, Fisher foot and knee valves are just what you need in your commercial kitchen sink for hands-free hand washing. Watch this video to learn more! With Fisher, finding a new faucet for your sink is easy! Start by figuring out your intended use. Do you need a controlled flow rate, or do you need a large volume of water quickly? Watch this video to learn what which faucet size is perfect for you! Don't be fooled into thinking that all faucets are made the same! Fisher engineers their 1/2" faucets for maximum longevity and minimum maintenance, providing you with a product that's guaranteed to last. Watch this short video to learn about the features that make Fisher superior in quality and reliability. 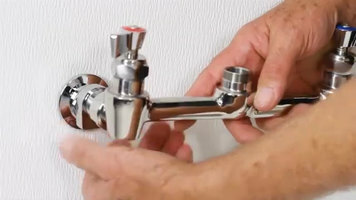 Installing a new faucet doesn't have to be difficult, and this video shows you why. Watch as a Fisher wall mount faucet and a Fisher backsplash faucet are installed, and learn what makes them different and what makes them reliable. Perfect for any operation, these Fisher faucets secure to existing water lines with ease and deliver long-lasting quality.